Some of our foods have very poetic names that at first impression bears no resemblance to the actual food at hand: Suspiro (Meringue Icing for Dominican Cake) seems to be one of those. Suspiro means “sigh” in Spanish. Once past the first impression, this fluffy-as-a-cloud icing seems to have found its perfect name. In other Spanish-speaking countries this is known as merengue (meringue), a confusing state of affairs, as Merengue is the Dominican Republic’s national music. What is Suspiro (Meringue Icing for Bizcocho Dominicano [Dominican Cake])? To be more specific, suspiro is nothing else than “Italian Meringue“, and bears some resemblance to Royal Icing. It is made with egg whites. The resulting meringue has firm peaks, but a smooth texture, perfect for covering cakes and making elaborate decorations. Depending on the amount of sugar added, the suspiro will remain soft but with firm peaks, or will start to harden after a few hours. Unfortunately, the latter means that it will contain so much sugar as to get past my tolerance level. In this recipe, I’ve incorporated some techniques that I’ve tested and yields a meringue that is firm, but not sickly sweet. Though I’m not sure why this technique was first used, adding boiling caramel to the egg whites has the fortunate side effect of decreasing the chance of salmonella contamination, a small but worrying possibility whenever we consume raw eggs. If you find pasteurized eggs where you live, I suggest you use those instead. If you’re looking for an easier alternative to suspiro, you can use powdered royal icing, just follow the instructions in the package. The amount of suspiro this recipe yields is enough to cover the half-pound cake in our recipe, if you wish to decorate further, please double the recipe. Suspiro Recipe (Meringue Icing for Dominican Cake): A poetic name, and the delicate texture of a cloud, the perfect icing for our divine national cake. Using the stand mixer wire whisk beat the egg whites for 30 seconds at low speed. 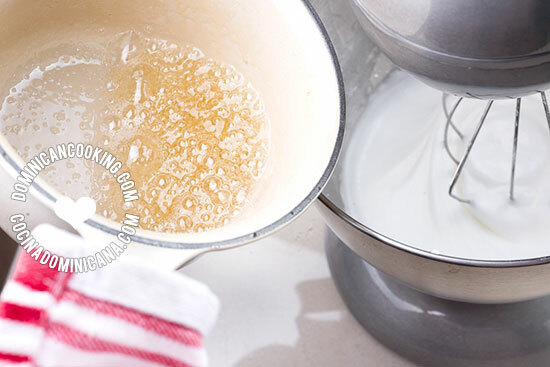 Increase speed to medium and whisk until they become white and has doubled (about 3 mins). Add the powdered sugar, cornstarch and cream of tartar, whisk until it has firm peaks (about 5 mins). Slowly, and in a thin stream, pour the caramel into the bowl, followed by the vanilla extract, whisking over high speed until it forms very firm peaks, and most of the meringue has "climbed" into the center of the wire whisk. To make Suspiro your utensils must be very clean. I suggest you wash them with warm soapy water and dry carefully beforehand. Humidity in the air and room temperature will affect the results when preparing 'suspiro'. Hot, dry days yield better Suspiros. The reason why I use cornstarch is to make the Suspiro firmer without having to add extra sugar that would make it sickly sweet. Cream of tartar is an acidic white powder used in baking to activate acid/base reactions without altering the flavors, in this case it improves the texture and "airiness" of the Suspiro. It can be found in the baking aisle of your local supermarkets. It's very cheap and lasts for years. I can not find Cream of Tartar anywhere……is there a substitute? 1/2 teaspoon of lime juice, though Cream of Tartar is still best. Mine came out like I just melted a giant marshmallow ??? Lol it came out extremely sticky and hard, and also some of my caramel hardened before it was completely mixed into the mixture. It seems like I keep having an issue with texture. The only thing I did different was I used carton egg whites instead of actual eggs, could that have messed up my suspiro? Any advice? I have never used anything but actual eggs, so I have no idea how it changes it. Loved the recipe. Thank you for sharing. 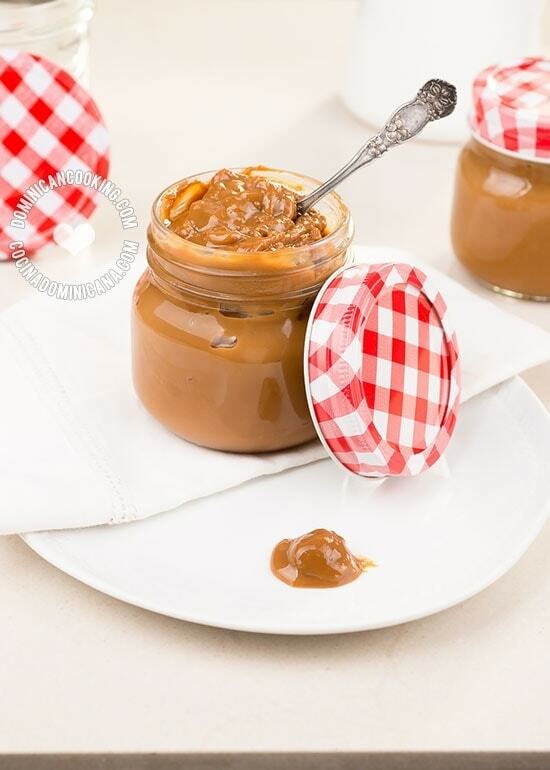 Just to confirm – if I’m using pasturized eggs, no need for the caramel? Or will omitting that affect the flavor? Yes, you may omit the caramel, but mind the texture, you may need to add a bit of extra powdered sugar. Se puede usar stavia? Como sustituto de azucar regular? I’ve never worked with Stevia. I can’t tell you if it would work.